For more than 25 years InterSystem has been a leading player in the palletizing of consumer products, specializing in solutions for the food industry. We have delivered over 600 units to industries on three continents. InterSystem is a partner you can trust and one that offers project design from the packaging machine to the warehouse, ensuring an efficient manufacturing process with short lead times and rapid installation and commissioning. We also offer support and training for our customers’ employees. InterSystem’s equipment is easy to install and set up and can be readily expanded, should production need to expand. Our palletizers are compact, space-saving and modular, enabling them to be adapted for most premises and packaging lines. They are also user-friendly and reliable, which minimises the need for maintenance and repairs. Product flows using pallets, both in warehousing and distribution, require an efficient palletizing operation. A palletizing system from InterSystem goes the distance, whether you opt for Single, Inline, Multi or ComPact Max. In addition to palletizers, InterSystem also manufactures and supplies conveyors for light goods and pallet handling, meaning we are able to offer a complete delivery with a common control system. A concept for optimized palletizing. Get to know ‘Das Maskin’, a compact, modular palletizer from InterSystem, which is space-efficient, user-friendly and easy to build on and finetune. The machine concept and its software can solve most of the palletizing challenges faced by a consumer products manufacturer. A modern palletizing system can handle the entire flow, from the packaging line to the warehouse. 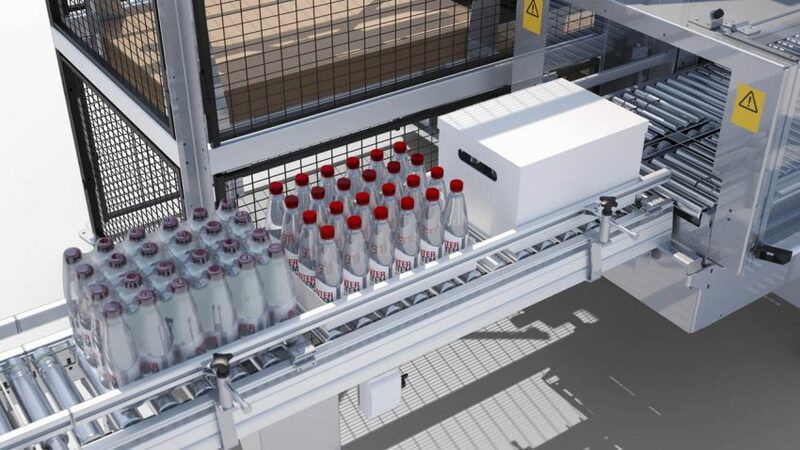 This means that the palletizer can easily be adapted and changed over for both short and long series and handle new packaging materials, new packaging solutions, new needs and changed flows. InterSystem’s palletizer is designed to handle several different types of packaging. The solution is not based on lifting the products and the design allows for large differences in the dimensions and shape of the products. The palletizer can therefore palletize radically different types of packaging without change-over processes or tool changes – and you can make product changes to an existing unit without any manual change-over. The concept behind the palletizer is smart, flexible and versatile and can handle most of the palletizing challenges you will encounter in a consumer products business. The palletizer is based on standard module dimensions, making it easy to combine with new concepts and solutions. Even if you start with a stand-alone machine, you will be able to change and add to it in the future when you need to transfer to inline or multi-concept lines. Flexibility and performance are still key factors. Stand-alone machine that usually handles a single product flow. Complete unit that usually consists of pallet magazine, product buffer, loading unit and pallet parking for finished pallets. Several single machines linked together with a common conveyor system for empty pallet and full pallet handling. Standard equipment can be used for pallet marking and stretch film wrapping for multiple product lines. Flexible solution that is easy to expand with additional product lines. Based on the same technical solution as the single machine, but with integrated pallet switching system for two to four product lines in one machine. A cost effective solution if your production allows for one machine to cover multiple lines. A further development of our basic machine. Continuous turning of the products and dual feed lanes enable high capacities, but still providing a space-efficient solution.